When function meets style then come the kicks. 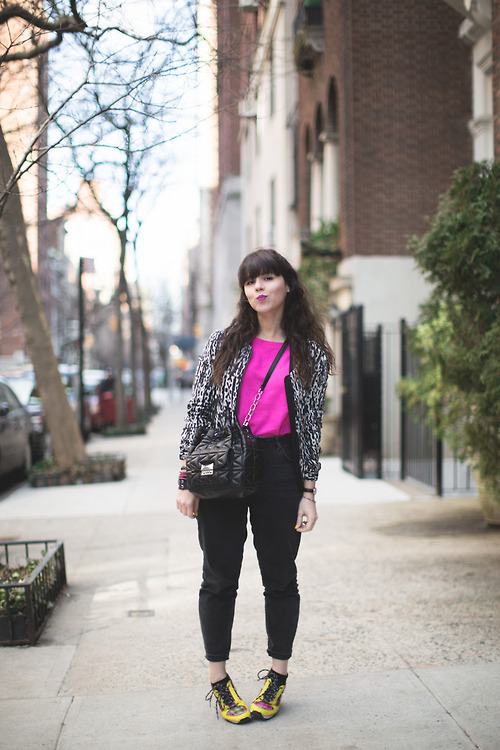 In today's post I want to draw your attention to these awesome shoes called sneakers. 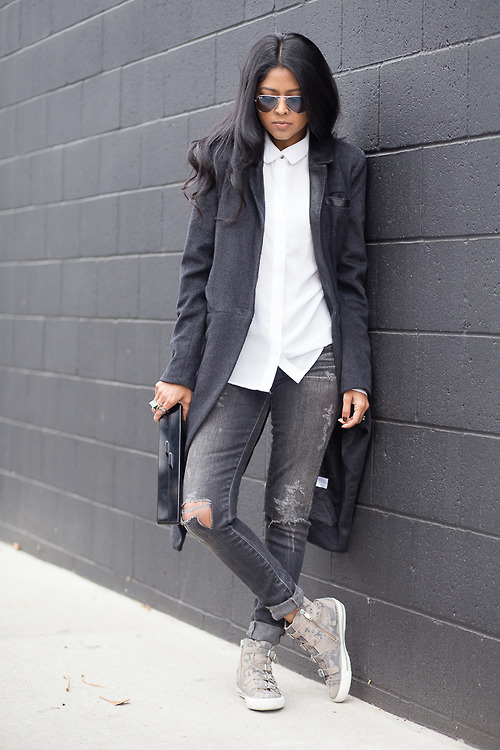 We are going to observe street style images and get to know how to wear sneakers for women. The good news about this footwear is the comfort, while the bad news are: if you used to wear heels, then work-out wardrobe can be hard to pull on. If you are wondering how is it possible to wear athletic runners without looking dowdy and weird, then you are in the right place, darling. We see perforated black leather jacket worn atop white top, black skinny jeans, silvery metallic shirt tied around the waist and black and white hi-top sneakers. Love the tote and oversized sunglasses. Speaking of possible combinations, then you can go for a leather jacket, knee-length dress, bowler hat and cool running shoes. It sounds as easy as it looks the same cool in real life. There are numerous of monochrome outfits that look the same bright with runners. The moto jacket will for sure make a contrast to the shoes. I personally love when runners are styled with beautiful layers (coat, scarf, robe). Make it fun and casual by wearing light blue denim jacket, light grey pullover, striped orange white straight skirt and lace-up white shoes. That's what I call a layered look. We see a loose-fit black coat, black patent leggings, Nike black and white sneakers, leopard print shoulder bag and statement shades. Make some fun by wearing a black slipdress and these sweet sneakers. Urban Grunge is back. Here we see a lady who appears with a grey beanie, biker vest, checkered shirt, black leggings and awesome trainers. Another awesome and modern look is shown in image above. We see awesome fashionista who wears mirrored sunglasses, baggy moto cover-up, lightweight top, high-waisted black shorts and metallized hi-tops. 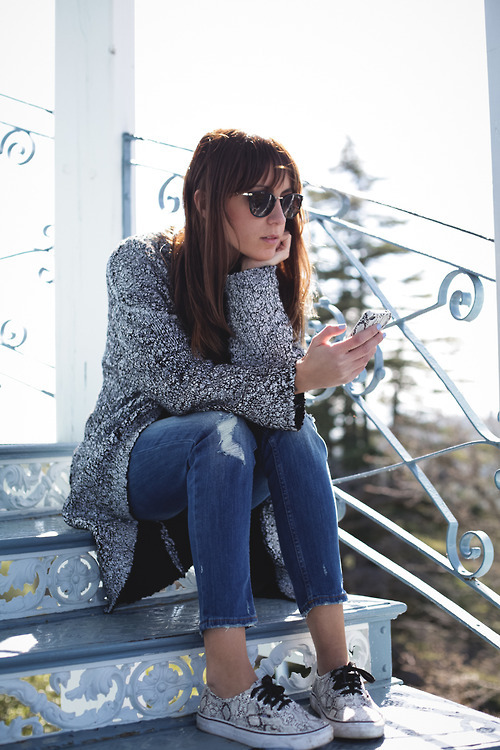 When it's cold, then you better go for cosy light grey coat, white sheath, black leather skinnies, white old scools and knitted beanie. Make some fun with a crop top, sweatpants, white old scools and belted wrap blue coat. Pale pink tailored coat looks fantastic worn atop white cable knit sweater, ripped jeans and white trainers. Keep it glamour by wearing a furry white crop jacket, pale blue jumpsuit, retro sneakers and pale pink accessories. The whole outfit can be dark (black, grey) but the shoes can be colored in bright fuchsia or pink color. Totally white look is another statement making outfit that makes you look stunning and individual. There are lots of possible ways how you can pair trainers in your everyday life, as you can team them with jeans, tennis, midi, maxi skirts, etc. The great plus of these comfort kicks is functionality, as well as the wide variety of styles, as you can find awesome flat designs as well as wedge styles. Urban hipster is walking down the streets. 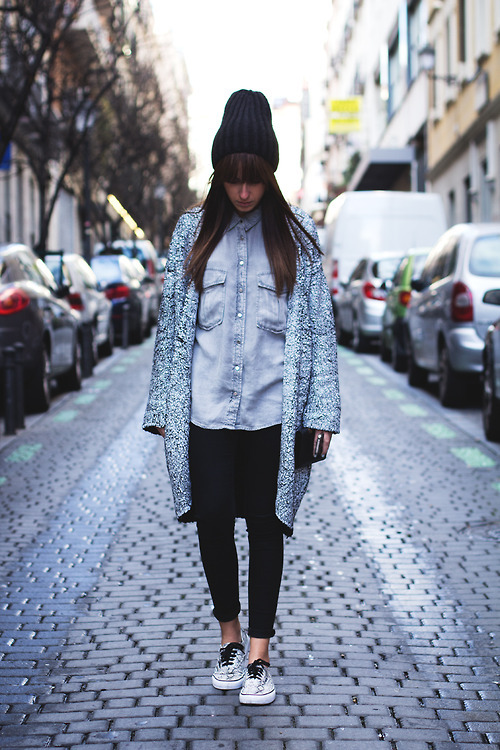 We see a creative peanut beanie worn with tweed cardigan, chambray shirt, black leggings and printed active shoes. How about wearing a fur cropped jacket, slouchy white tee, black jogging pants and black runners with fuchsia details. Black blazer, light grey tank, black leather leggings, running shoes, black tote and aviator mirrored sunglasses- that's what I call urban glamour chic. 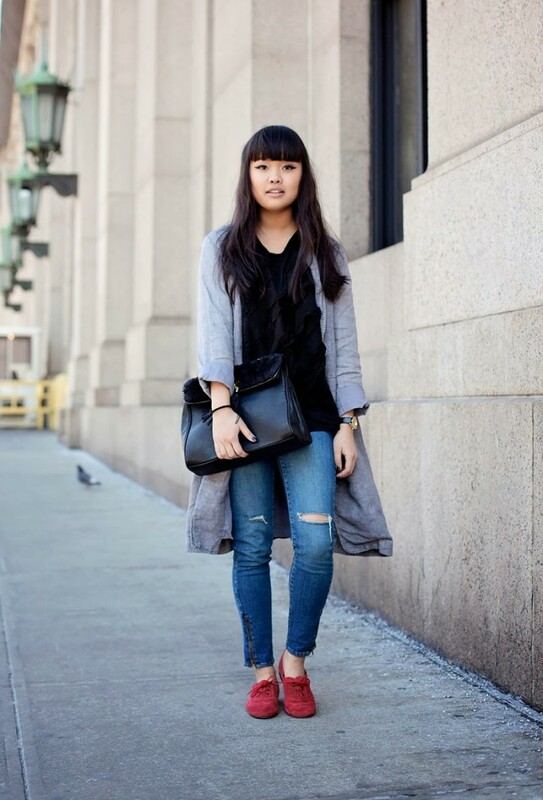 Grey coat looks fantastic worn atop white shirt, ripped grey skinnies and camouflage hi-tops. Another great thing is that you can give your feet a break from heels. Nowadays fashion brings ultra modern styles that make you look surprisingly stylish. Anyway, if you are not fancy with sporty vibes, then there are cool monochrome designs that are still comfy and do not look like trainers. Look through these images for your inspiration.